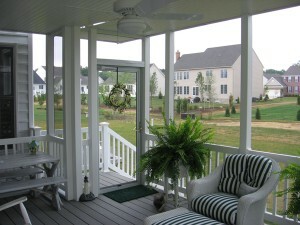 A screen porch can help beat the heat! If you’ve stepped outside lately, then you have probably realized that summer is here and it’s going to be a hot one. On top of the heat, the mosquitos have hatched and the humidity has made a lot of people abandon their lawn chair in favor of air conditioning. Now, what if you could address all three of those issues with one home improvement? Well, you can. A screen porch will eliminate the discomforts of being outside during the summer months. If you’d like to find out more about investing in a screen porch, then check out the rest of this blog. Let’s get going! Create the perfect spot to relax outdoors. A screen porch has all the benefits of being outside without any of the inconveniences. Any furniture or nice plants you place within your screen porch do not have to be moved or covered when it rains because the screen will protect them. Not only that, but you can relax in your screen porch without having to worry about mosquitos or other bugs unless the sneak in while the door is open. Not only that, but if you have a fan installed then the humidity won’t be quite as stifling as it could be. The electrical outlets that come with hanging out in a screen porch also enhance the space. You can charge your phone while you enjoy the sounds of the crickets. You can even plug in a television or a small refrigerator. It’s 2015 and you can have a modern outdoor experience if you want to. The investment has serious returns. Installing a screen porch has about a 75% return on investment if you decide to sell your home one day. Now, there are some things to consider if you want to make the most of your investment before you have the screen porch installed. One of the first things you should think about is the size of your potential porch. A bigger screen porch may cost a little more, but potential buyers will see it as another excellent living space. Furthermore, if you want to maximize your investment, you should try to keep the materials and any installations economical.